Flip through photos of the unique custom cleats made for Broncos players and the causes they represent for this year's My Cause My Cleats campaign. 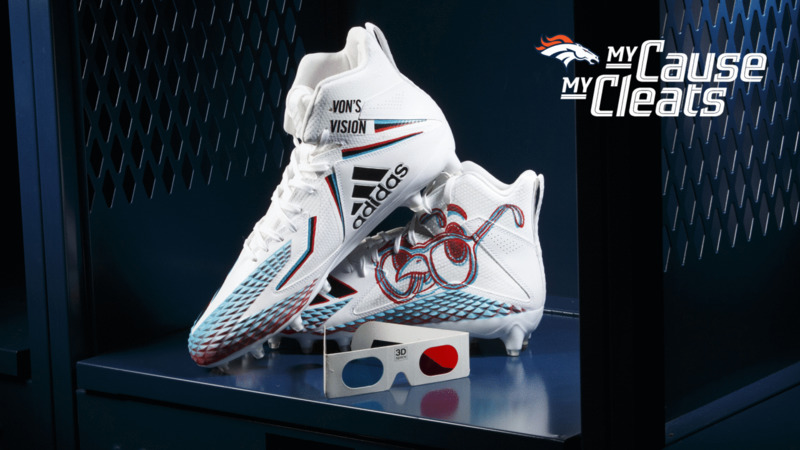 Von Miller's cleats represent his Von's Vision foundation, which helps underprivileged kids get vision care, for My Cause My Cleats in 2018. Dymonte Thomas' cleats represent the CHARGE Syndrome Foundation, an organization that promotes awareness and research for CHARGE syndrome, for My Cause My Cleats in 2018. Troy Fumagalli's cleats represent the Alzheimer's Association, which aims to improve research for Alzheimer's disease and provide support and care for those fighting the disease, for My Cause My Cleats in 2018. Isaac Yiadom's cleats represent Pencils of Promise, an organization the promotes education around the world, for My Cause My Cleats in 2018. Joe Jones' cleats represent Children's Miracle Network, an organization that raises funds for children's hospitals and medical research, for My Cause My Cleats in 2018. Phillip Lindsay's cleats represent Urban Peak, a Denver organization that provides help to children who are homeless or at risk of becoming homeless, for My Cause My Cleats in 2018. Justin Simmons' cleats represent Fuel Up to PLAY 60, a school nutrition and wellness program, for My Cause My Cleats in 2018. Keishawn Bierria's cleats represent the American Cancer Society, which is "dedicated to helping people who face cancer," for My Cause My Cleats in 2018. River Cracraft's cleats represent Hilinski's Hope, a foundation raising funding and awareness for mental health for student athletes, for My Cause My Cleats in 2018. Emmanuel Sanders' cleats represent the Emmanuel Sanders Foundation, which aims to help kids receive the resources they need to play sports and learn fundamental life lessons, for My Cause My Cleats in 2018. Chris Harris Jr.'s cleats represent the Chris Harris Jr. Foundation, which aims to help underdogs achieve their goals, and Mentor Colorado, which helps youth in Colorado communities find role models and mentors, for My Cause My Cleats in 2018. Jeff Heuerman's cleats represent Parent Project Muscular Dystrophy, which "fights to end Duchenne muscular dystrophy," for My Cause My Cleats in 2018. Will Parks' cleats represent Philadelphia CeaseFire, an organization in Parks' hometown that aims to reduce violence through community initiatives, for My Cause My Cleats in 2018. Josey Jewell's cleats represent Logan's Hope, which is for a boy named Logan who has Duchenne muscular dystrophy that Jewell met at Iowa, for My Cause My Cleats in 2018. Ron Leary's cleats represent the Ron Leary REACH Foundation, which aims to help underprivileged youth, for My Cause My Cleats in 2018. Casey Kreiter's cleats represent the Gamers Outreach Foundation, which provides children in hospitals with recreation through video games, for My Cause My Cleats in 2018. Bradley Roby's cleats represent Oxfam, "a global organization working to end the injustice of poverty," for My Cause My Cleats in 2018. 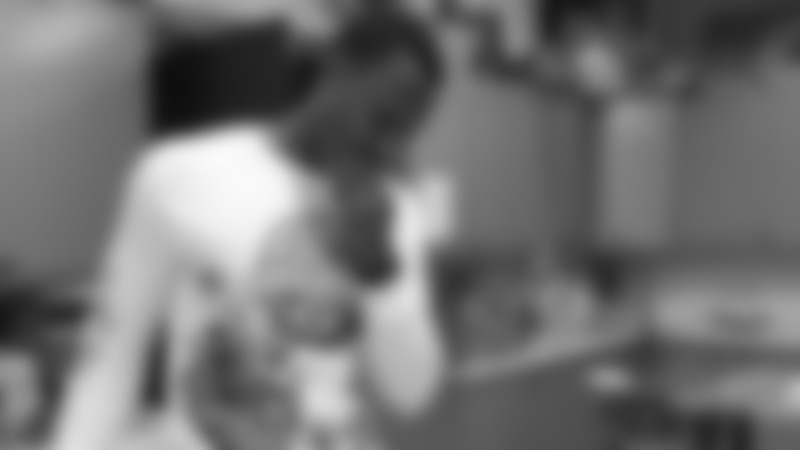 Todd Davis' cleats represent his A+ Living Foundation, which aims to help children unlock their potential in academics athletics, motivation and social participation, for My Cause My Cleats in 2018. Domata Peko Sr.'s cleats represent The Domata and Anna Medical Center of Hope, a hospital Peko is helping fund in American Samoa, for My Cause My Cleats in 2018. Shelby Harris' cleats represent the Breast Cancer Research Foundation for My Cause My Cleats in 2018. DaeSean Hamilton's cleats represent Susan G. Komen, a foundation that "addresses breast cancer on multiple fronts such as research, community health, global outreach and public policy," for My Cause My Cleats in 2018. Darian Stewart's cleats represent his Stewart Standouts Foundation, which "is dedicated to encouraging the growth and development of the youth," for My Cause My Cleats in 2018. Zach Kerr's cleats represent the Foundation for Sarcoidosis Research, which he has partnered with in his "Sack Sarcoidosis" campaign to raise awareness for the inflammatory disease, for My Cause My Cleats in 2018. Brendan Langley's cleats represent the Ehlers-Danlos Society, "a global community of patients, caregivers, health care professionals and supporters dedicated to saving and improving the lives of those affected by Ehlers-Danlos syndromes, hypermobility spectrum disorders and related conditions" for My Cause My Cleats in 2018. Alexander Johnson's cleats represent Alzheimer's Association for My Cause My Cleats in 2018. Tim Patrick's cleats represent the Knights of Heroes Foundation, which aims to provide "positive adult mentorship, character development and lasting friendships" to children who have lost their fathers through military service, for My Cause My Cleats in 2018. Brian Parker's cleats represent Susan G. Komen, a foundation that "addresses breast cancer on multiple fronts such as research, community health, global outreach and public policy," for My Cause My Cleats in 2018. Andy Janovich's cleats represent Hunting with Soldiers, a foundation that aims to help combat veterans heal from PTSD through hunting, fishing and other outdoor retreats, for My Cause My Cleats in 2018. Courtland Sutton's cleats represent the Boys & Girls Clubs of America, a national organization that provides after-school programs and activities for children, for My Cause My Cleats in 2018. Sam Jones' cleats represent Children's Hospital Colorado for My Cause My Cleats in 2018. Adam Gotsis' cleats represent Around the Campfire, a foundation "focusing on improving the physical and mental health of indigenous Australians," for My Cause My Cleats in 2018. Jared Veldheer's cleats represent the Van Andel Institute, a medical research (particularly for Parkinson's disease and cancer, among other diseases) and science-education organization, for My Cause My Cleats in 2018. Austin Schlottmann's cleats represent the Special Olympics for My Cause My Cleats in 2018. Bradley Chubb's cleats represent his and his brother's foundation, the Chubb Foundation, which "use[s] sports as a platform to activate human potential," for My Cause My Cleats in 2018. Case Keenum's cleats represent the Fellowship of Christian Athletes, an interdenominational Christian sports ministry, for My Cause My Cleats in 2018. DeMarcus Walker's cleats represent Children's Hospital Colorado and were designed by children from the hospital for My Cause My Cleats in 2018. Shane Ray's cleats represent his Rays Awareness Foundation, which works with Denver Rescue Mission and other nonprofits to help underprivileged children receive, shoes, cleats, playground supplies and school supplies, for My Cause My Cleats in 2018. Garett Bolles' custom cleats represent the National Center for Learning Disabilities and his GB3 Foundation for the 2018 My Cause My Cleats campaign. Max Garcia's custom cleats representing the International Justice Mission for the 2018 My Cause My Cleats campaign. After weeks of waiting, Broncos players finally got to see their custom cleats for the 2018 My Cause My Cleats campaign.